John McElroy, Autoline.tv and Gary Vasilash, Automotive Design & Production answer viewer questions about GM CEO Mary Barra’s appearance before Congress on June 18, 2014 regarding the botched ignition switch recall. We’re LIVE at 8AM ET/13:00 GMT from Inforum’s 12th Annual Auto Show Breakfast featuring Ford Motor Company COO Mark Fields! Join John McElroy as he moderates panels organized by groups such as OESA, the Canadian Consulate and the US-China Automotive Exchange. 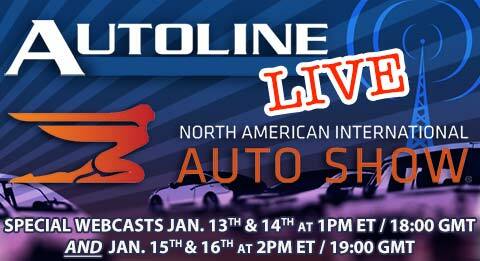 John McElroy and the Autoline team cover the 2014 North American International Auto Show in Detroit. 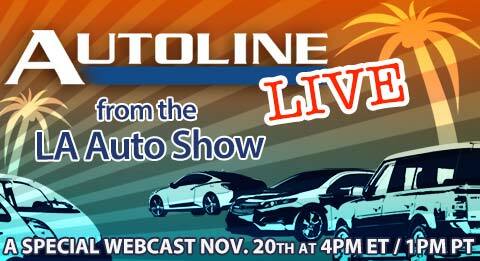 John McElroy and the Autoline team are hitting the ground running in the New Year by bringing you a week of LIVE webcasts from North America’s premiere auto show, headquartered in the heart of Detroit! The week starts off with two days of broadcasts on January 13 and 14 from the floor of the North American International Auto Show where we’ll bring you interviews with the show’s biggest newsmakers and get up close with the most important vehicle reveals of the show. Then join us on January 15 and 16 as we come to you LIVE from the second-annual Autoline Supplier Symposium, held during Industry Days at the Detroit auto show. We’ll take a deep dive into the issues that matter most to the auto industry’s all-important supplier community. So, mark your calendar for these LIVE webcasts you don’t want to miss! Send your questions and comments via Twitter. Just use the hashtag #NAIASLIVE. Join John McElroy as he hits the show floor in Los Angeles to check out all the newest cars and concepts being revealed by the world’s biggest automakers. This year he talks to some of the most influential executives in the business including John Krafcik, Hyundai; Mark Reuss, GM; Detlev von Platen, Porsche and many more! Join John McElroy as he hits the show floor in Los Angeles to check out all the newest cars and concepts being revealed by the world’s biggest automakers. This year we’re talking to some of the most influential executives in the business including John Krafcik, Hyundai; Harald Wester, Maserati; Detlev von Platen, Porsche and many more! Get our full guest list and question form here or start sending your questions in now using Twitter! Just submit them with the hashtag #laaslive. Join John McElroy as he walks the floor of the 2013 Frankfurt Motor Show bringing you first looks at the latest product reveals as well as interviews with the designers and executives behind them. Jonathan Browning, Pres. & CEO, VW Group of Am.